Natural colored diamonds are available in every color of the rainbow and then some. For most people interested in colored stones, they are most likely to be satisfied with gemstones since the colors are more to their liking. 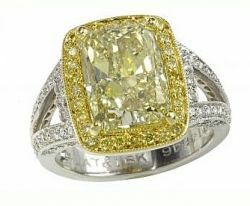 But for those who want the exotic and can afford it, natural colored diamonds make an exciting and luxurious choice. In the right setting, it can be a masterpiece that can become your own piece of history. 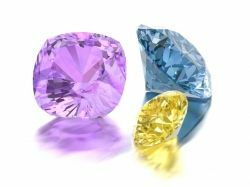 Lets dive into the article and see the different types of colored diamonds and what makes them special. When most people think of colored stone jewelry, their minds turn to gemstones such as rubies, sapphires, and emeralds. In most cases they would be right. However, for the jewelry connoisseur, they should also consider the most beautiful, brightest, and durable gemstone of all - the diamond! Most people don't realize that diamonds come in colors other than clear. The jewelry industry calls these diamonds "white". However, the knowledgeable jewelry aficionado knows that some of the most beautiful diamonds in the world come in a rainbow of colors. This narrative will unlock some the secrets behind colored diamonds - their rarity, their cost, and their true beauty. First of all, the most desired colored diamonds are all natural. This means the diamonds come out of the ground the color they are polished to and are not treated or modified in any way to bring out or enhance their color. A diamond must be certified by a gemological laboratory such as GIA, AGS, or IGI in order to be called natural. Natural colored diamonds represent less than 1% of all diamond rough processed. Some sources say this number is as small as one carat of every 10,000 carats processed. To say that natural colored diamonds are rare is an understatement! Natural colored diamonds may be one primary color or modified with a secondary hue or hues. A single colored diamond with no modifiers is more rare than one with secondary hues and therefore commands a higher price (one trend you will notice as you read on is that diamonds, whether they are white or naturally colored, follows the basic laws of supply and demand - the more rare something is, the more expensive it is). Natural colored diamonds are also graded for color differently than white diamonds. White diamonds use a color grading scale that starts with "D" which represents the whitest color and goes down to "Z" which represents the least white color. Naturally colored diamonds are graded in this order: faint, very light, light, fancy light, fancy, fancy dark, fancy intense, fancy deep, and fancy vivid. With most natural colored diamonds, the more desirable stones are the ones closer to fancy vivid and, accordingly, the more expensive they are. Black diamonds get their color from the addition of heat to the stones. Since the exact amount of heat necessary to create these diamonds naturally is almost impossible to happen, natural black diamonds are almost non-existent. 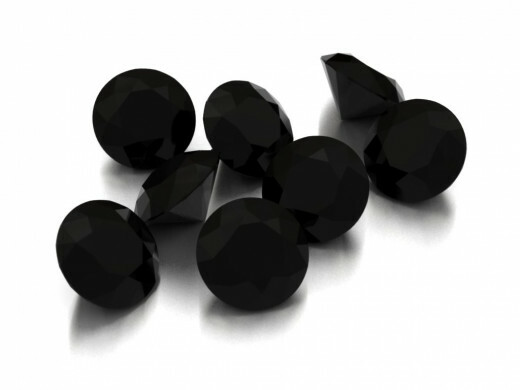 Most black diamonds that are found for sale are heat-treated to get them to that color and most of these diamonds are of lower quality to start with so their cost is very reasonable. 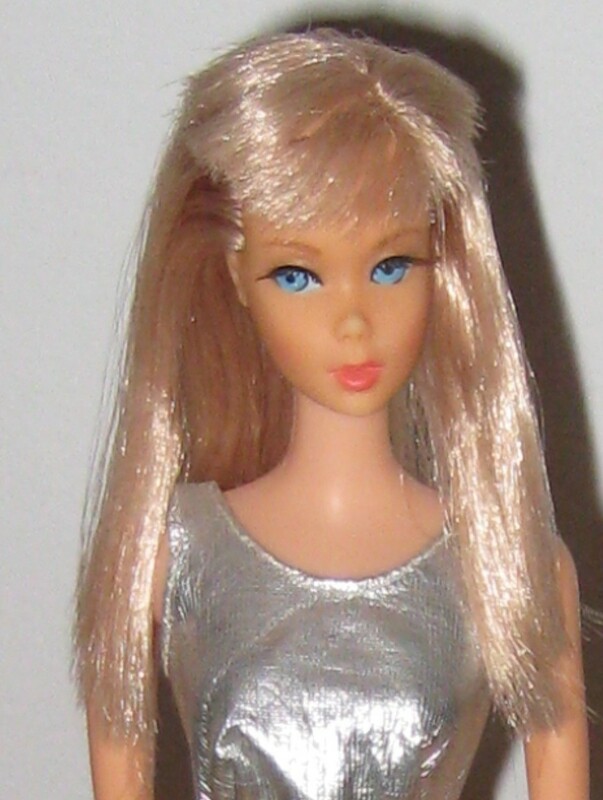 Their popularity has increased in recent years due to their unique color, low prices, and fashionable appearance. Brown diamonds are created by the absorption of light by structural defects in the diamond lattice. White diamonds, as you move down the color grading chart, show brown color in addition to their own. True brown diamonds would actually appear on the white diamond color grading chart after "Z" but are still graded according to the color grading scale for all natural colored diamonds. Many of the naturally colored brown diamonds come from the famed Argyle Mine located in Northwestern Australia. Since the owners of this mine are actively involved with the marketing of these stones, they have come up with other names for brown diamonds in order to make them more marketable. These names include champagne, cognac, and chocolate. They also have developed their own color grading scale which ranges from C1 to C7. However, most of the world still uses the GIA color grading scale. 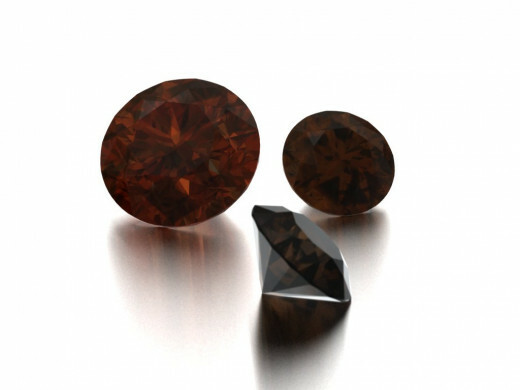 Natural brown diamonds most often have secondary hues present of yellow, orange, or pink as modifiers to its primary color. The most famous natural brown diamond is the 69.93 carat "Golden Pelican" which is a rectangular cut emerald cut stone. Its unusual name comes not from the pelican bird, but the famous street in the diamond district of Antwerp, Belgium where the stone was cut, the Pelikaanstraat. Additionally, the "Golden Jubilee" is the largest faceted cut diamond in the world at 545.67 carats! Grey diamonds are formed by the addition of hydrogen and sometimes boron in the structure of the diamond. As you could imagine, because of the negative connotation of the color grey, these stones go by other names to make them more salable such as charcoal, steel, pigeon, slate, and silver diamonds. Secondary hues in grey diamonds are all the known colors of natural colored diamonds. A natural grey diamond is a relatively uncommon stone. However, the pricing of this hue remains lower on the spectrum of all colored diamonds. For this reason, it is a great colored alternative to a colorless diamond. Natural yellow diamonds, sometimes referred to as canary diamonds, get their color from the presence of nitrogen in the carbon lattice. While white diamonds may look yellowish as they move down the D-Z color grading scale, a natural yellow diamond's color starts right below the "Z" color grading and are graded as all natural colored diamonds are. Secondary hues found in yellow diamonds include brown, green, grey, and orange. One of the best known yellow diamonds in the world is the "Incomparable", a 407.48 carat shield-shaped step cut diamond graded fancy brownish-yellow, but internally flawless. Connoisseur Louis Glick is the owner of this diamond after twice trying unsuccessfully to sell the "Incomparable" at auction with a reserve price of $20 million. Pink, being the color of love, has an extremely high amount of popularity despite its rarity. Because of this, natural pink diamonds command higher prices per carat than diamonds more rare than itself. 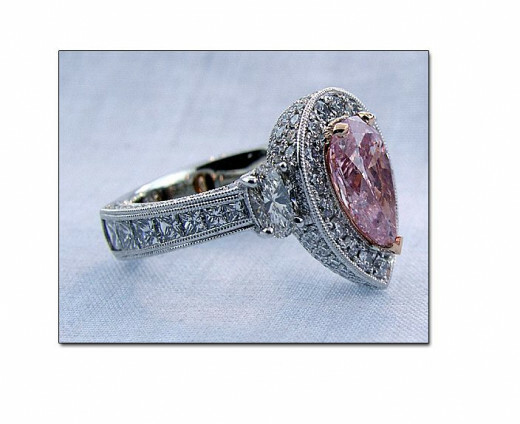 Natural pink diamonds are formed by a "plastic deformation" of the crystal as it is being formed. Before the discovery of the Argyle Mine in Northwestern Australia in 1985, natural pink diamonds were far rarer than they are now and were found on a hit or miss basis. With the discovery of the mine, natural pink diamonds became more abundant and 90% of the world's supply of pink diamonds come from here. While pure pink diamonds are available, most have secondary hues such as purple (most common), orange, or even red as modifiers. Some famous pink diamonds include the Darya-ye Noor Diamond, part of the Iranian Crown Jewels, and the largest Natural Pink Diamond in the world with an approximate weight of 182 carats! The Graff Pink is a 24.78 carat emerald cut fancy intense pink diamond, and is the most expensive jewel ever sold at auction at $46 million! Queen Elizabeth II received a 23 carat pink diamond as a wedding present and had it mounted in a diamond encrusted brooch. The Steinmetz Pink, the largest fancy vivid pink graded diamond, was unveiled in 2003 and weighs 59.6 carats. Finally, pink diamonds got celebrity notice when Ben Affleck gave Jennifer Lopez a 6 carat pink diamond engagement ring! Natural orange diamonds get their color by the presence of nitrogen and defects in the crystal lattice. Because the color orange is a combination of yellow and red, the primary colors of orange diamonds range from red orange to yellow orange. These colors are then further modified by secondary hues of red, pink, purple, and yellow. The most famous orange diamond is the "Pumpkin Diamond", purchased at auction by Ronald Winston of Harry Winston Jewelers the day before Halloween and renamed because of its color and the significance of the purchase date. It is graded fancy vivid orange and weighs 5.54 carats. It gathered further significance when it was worn in a ring by Halle Berry at the 2002 Academy Awards when she won Best Actress. 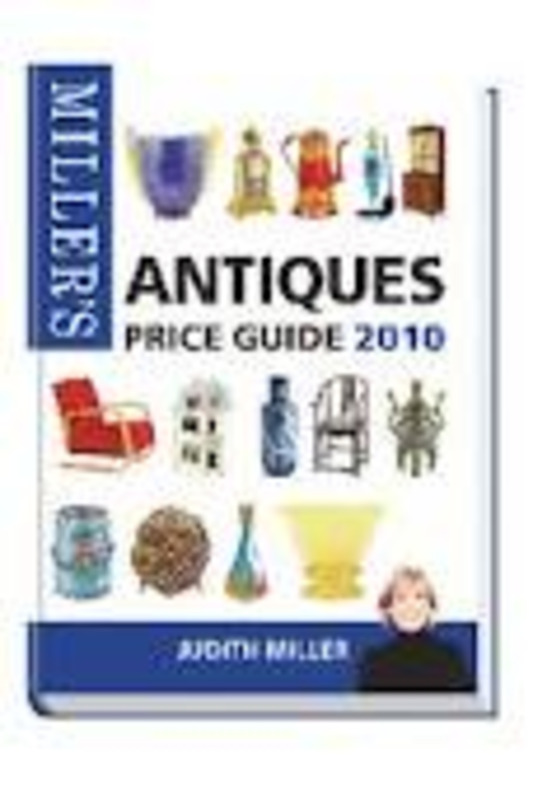 Its current value is $3 million! Natural blue diamonds get their color from the presence of boron in their structure. Blue diamonds may be grey-blue, modified by increased boron content in their structure, or green-blue, modified by nitrogen in their structure. The most famous blue diamond in the world is also the best known - The Hope Diamond. Weighing in at 45.52 carats and fancy deep grayish blue, this allegedly cursed diamond was donated to the Smithsonian Institute by its final owner, Harry Winston. Another famous blue diamond is the Wittelsbach Blue Diamond which was a 35.56 carat cushion shaped diamond that was graded Fancy Deep Greyish Blue in color and VS1 in clarity. This stone was sold in 2008 by Christie's in London for the equivalent of $23.4 million to London jeweler Laurence Graff who almost immediately had the stone recut to 31.06 carats in order to make the stone more valuable. He probably succeeded because after the recut the stone was graded again by GIA and earned a Fancy Deep Blue color grading and an IF (Internally Flawless) clarity grading! 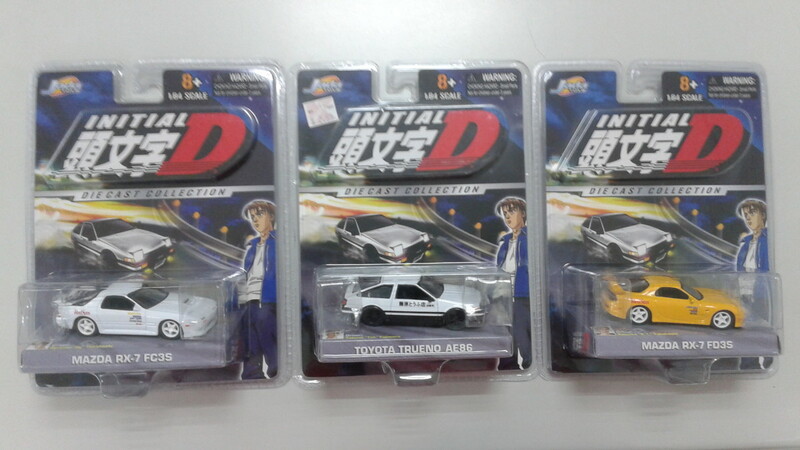 A great example of a blue colored diamond would be the one featured in the picture. 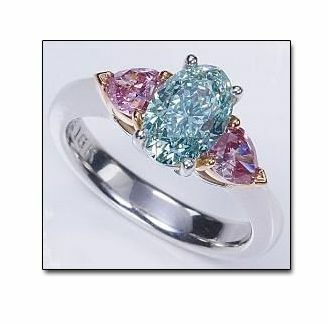 This ring features a blue diamond with a greenish hue. This blue-green diamond is very rare especially with such beauty! This ring features two trillion cut pink diamond side stones set in 18k rose gold. The ring was crafted using 18k white gold. Among the rarest of the natural colored diamonds are the purple diamonds. True purple diamonds are almost non-existent and are created by unusually high amounts of hydrogen in the structure of the diamond. Most natural purple diamonds are modified by pink so that they are known as pinkish-purple diamonds. Most are smaller than two carats and most are cut as round brilliants. Enhanced purple diamonds are available a substantial discount to natural purple diamonds although they are not inexpensive by any means. 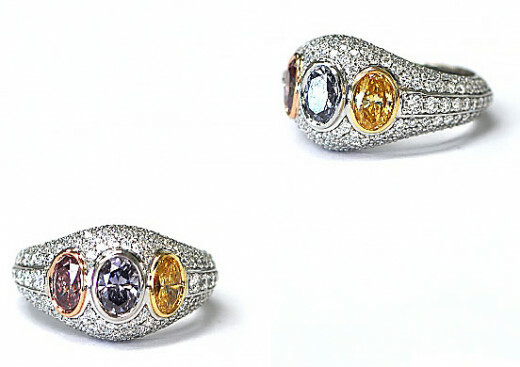 They are enhanced because when diamonds are manually heat-treated to turn diamonds to yellow they turn purple first. Most larger purple diamonds are formed in this manner and it must be disclosed to the buyer that the stone is not natural in color by the seller under law. A subset of natural purple diamonds are violet diamonds. These diamonds are modified in color by grey and blue and almost never appear without a secondary hue. In fact, a leading expert in natural colored diamonds has said that there has only been one true violet diamond he has ever seen and he still isn't sure if it was true violet or not! There are three famous purple diamonds known in the world and little is known about two of them - the Royal Purple Heart Diamond, and the Supreme Purple Star Diamond. 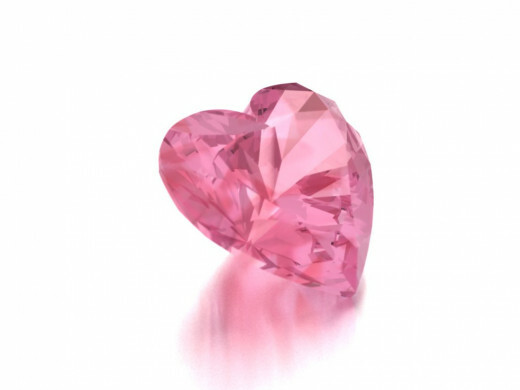 The Royal Purple Heart is the largest Fancy Vivid Purple diamond at 7.34 carats and is clarity graded I1. It was mined in Russia, but other than those facts, not much else is known, not even the current owner of the stone. Even less is known about the Supreme Purple Star. It is said to be cranberry in color and somewhere between 4-5 carats. Everything else about this stone is a mystery to the world. The purple diamond came to the forefront in 2003 when professional athlete Kobe Bryant gave his wife an 8 carat purple diamond ring after it was discovered he had a marital infidelity. Suddenly the demand for purple diamond engagement rings went up, until the price for such a ring was discovered. At an average price of $200,000+ a carat, only the grooms with the deepest pockets could afford a natural purple diamond engagement ring. One very rare color of natural colored diamonds are green. They are unusual in that their formation is not from any defects found in the diamond. They are formed from exposure to radiation that occurs naturally in the soil, most likely from uranium ore. Natural green diamonds, because of the method of their formation, are often only green on the surface. 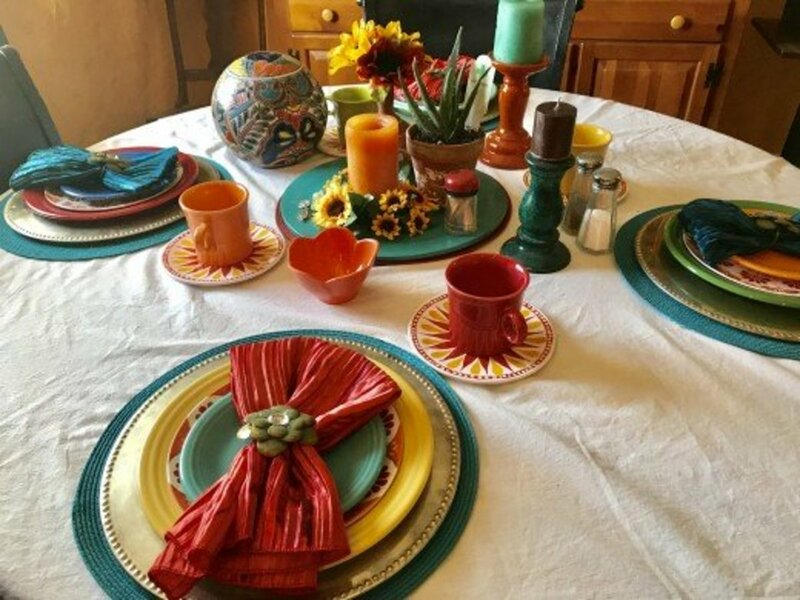 Those with deeper saturation of color are even more valuable. Secondary colors to green diamonds include yellow, blue, brown, and grey. 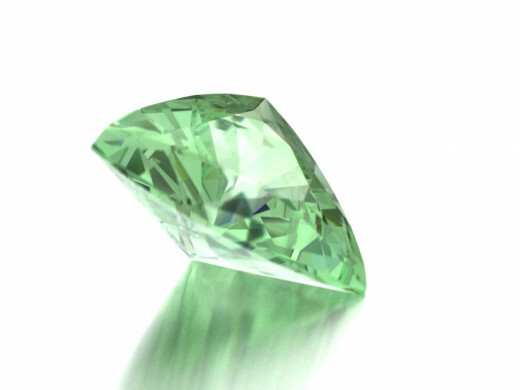 There is only one well-known natural green diamond - The Dresden Green. 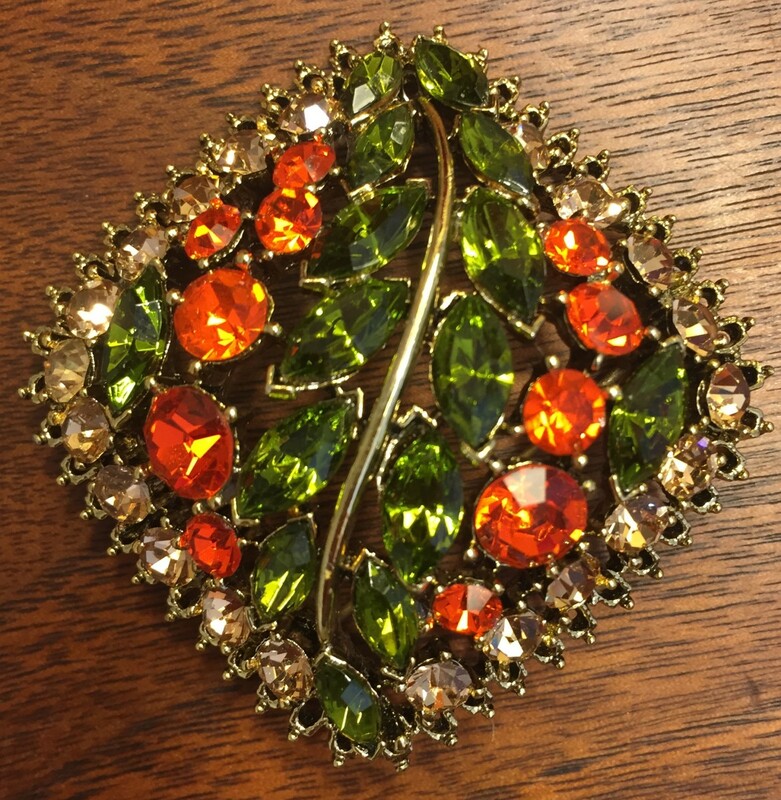 The Dresden Green weighs approximately 41 carats, and gets its name from Dresden, the capital of Saxony in Germany. The stone's existence was first noted in 1722, and has spent most of its recorded life in Dresden proper. Its current home is the Staatliche Kunstsammlungen Dresden, or "The New Green Vault". One of the most rare natural colored diamonds are red. They are formed by the same process as pink diamonds, and that is through structural defects in the lattice of the crystal. Almost all red diamonds have secondary hues that modify its red color such as pink, purple, and brown. In fact there are only a few diamonds that GIA has graded as Fancy Red (unmodified). 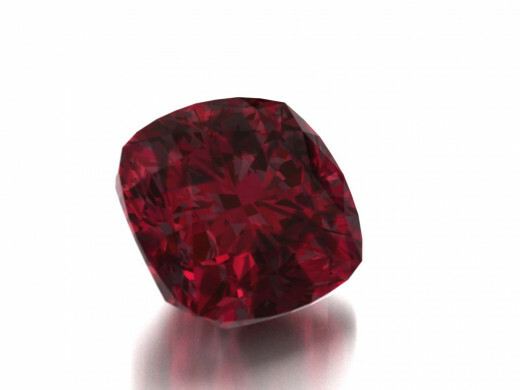 The largest of these is the Moussaieff Red, a 5.11 carat triangular brilliant cut diamond. The reddest red diamond is the Rob Red, a 0.59 carat pear shaped fancy intense red diamond. 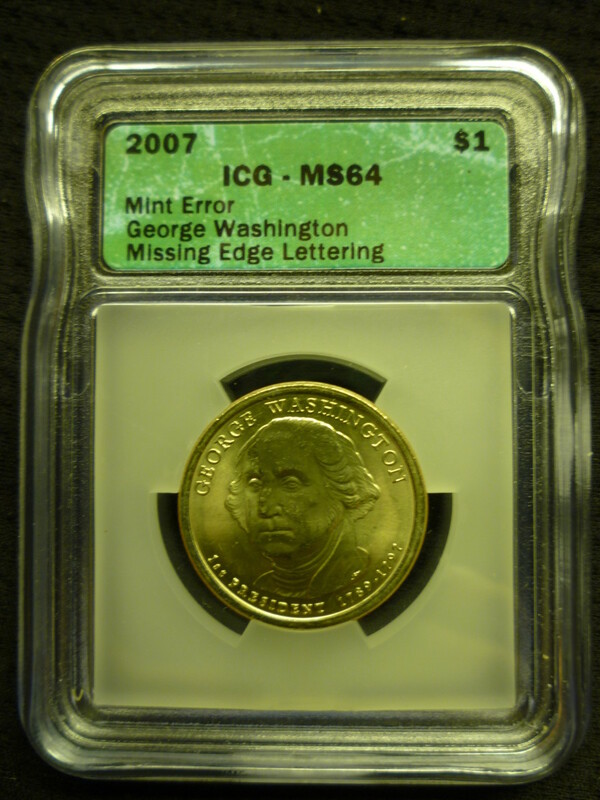 It is also unique in that it is relatively clean with a VS1 clarity grading. Most jewelers have never seen a red diamond let alone have the opportunity to sell one. Most customers, when talking about a red diamond, imagine a diamond the color of a ruby. They will be greatly disappointed. Most red diamonds have nowhere near the depth of color that a ruby has. They are truly a stone of their own. What is your favorite color of diamond? Let us know what you think about our colored diamond article! Our Colored Diamond Guestbook! - We always enjoy hearing feedback! What are your thoughts? @anonymous: Thank you for reading! @thegembank: We agree! Brown diamonds come in many different shades as well! Thanks for the comments! Beautiful colored diamond rings. Thanks for sharing.